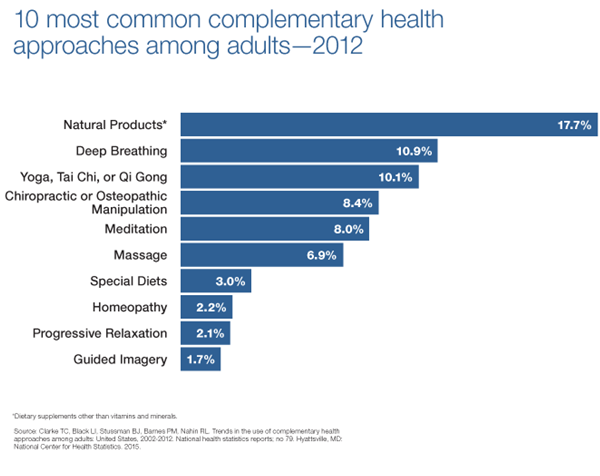 It is interesting to find that there is often another word that is used along with “alternative medicine”, and that is “complementary medicine.” Combining those two terms gives us what is referred to as CAM – complementary and alternative medicine. Efforts to develop CAM represent substantial work and dedication on the part of many people, so it is surely something that is praiseworthy. For practitioners such as Dr. Davis, “in the trenches”, in clinical practice dealing with difficult cases that do not respond to mainstream medical intervention, CAM presents some very real challenges. A good example is the following. When patients have the threat of an embolism or a past history of a blood clot, standards of medical care require that the physician place the patient on anti-coagulant therapy (which has clear long-term harmful side-effects.) Often this is done as simply a preventive measure, and if a patient adopts a diet that can heal the damaged interior of blood vessels, avoids “oxidative stress” that arises from eating fried foods and synthetic ingredients, and takes specific supplements for vascular repair, anti-coagulants may become unnecessary. And if there were still some possibility that there could be a risk, natural anticoagulants that have been proven for thousands of years (used in ancient China) can accomplish the blood thinning task efficiently and safely, AND that can be verified by simple blood tests for clotting time. The CAM medical doctor is at risk of a malpractice lawsuit if he places a patient on a non-prescription drug natural anti-coagulant and a vascular accident (e.g.stroke) were to happen to the patient. The well-informed natural healthcare provider might know of the clinically proven effectiveness of natural anti-coagulants, but he is not licensed to prescribe a medication or to remove a prescribed medication. A potentially viable safe alternative to the prescription drug exists, but cannot be used. So what happens in actual practice? If the patient is informed, motivated towards optimal health, and is bold enough, he will, on his own take the natural anti-coagulant supplement and demand that his medical physician perform the necessary blood clotting tests to measure if the natural alternative is doing the job. The medical practitioner will in this case, for reason of professional censure or malpractice liability, often refuse to assist his patient. Dr. Davis has seen this actual example occur several times. As good as it sounds, CAM is hard to put into practice.